Updated! I was commenting on my last post that the replies of Ambassador designate to Venezuela, Larry Palmer, to Senator Lugar were rather interesting. In them, among other pearls, he discussed the lack of morale of the Venezuelan army, the Cuban influence, the inability of Chavez to make real his threat of cutting oil supply to Venezuela and other such. I read them as mild mannered since I am living at ground zero and thus all what Palmer said is true and in fact much worse than what his diplomatic language implied. But of course the reality to which I should have been more sensible is that no ambassador can ever express itself on internal matters of the country he is sent to, the more so that he has not set foot in that country yet. Sure enough today Venezuela was duly upset and sent nothing less than the defense ministry to reply, proving indirectly that whatever Palmer said did hit bull's eye somewhere. The retort from State was that it shared the worries of Larry Palmer. Yeah, right, as if they were not the ones who coached him before the hearings..... You can read a tidbit in English here from CNN as the news obviously does not rate very high in the Google news page on US foreign policy. One hypothesis is that the questions to Palmer were not supposed to be made public, at least not yet, not until he had reached Caracas. If we have a leak from the US Senate foreign committee then it might be due to the desire to downgrade at least for the time being the nature of the US representation to Caracas. But then again State came to support Palmer without obvious strains between Lugar and State. Are we in front of a concerted policy to have Chavez reject Palmer as an ambassador to Venezuela forcing Obama to name another one, a process that would last at least until next year to confirm? I am not the fly on the wall to be able to tell you exactly what kind of game is being played right now between GOP and Dems, Senate and State, over what to do about Chavez, but I must admit that it would make sense for the US not to have an ambassador in Caracas for a while without needing to break relations with the US. Why do I say that you may ask? First, the ludicrous but ever useful racial card. Larry Palmer is an African American, and a very dark one at that. With a US president and a US ambassador as African Americans that would put Chavez racial stupid games in check, the more so if he refuses to receive Palmer. I know, I know, we are in the XXI century but do not forget that Chavez has not quite left the XIX century yet, he does not think PC like we do and the State Department should not waste such an opportunity to annoy Chavez. But another much more acceptable explanation is that simply the US is tired of being the convenient punching ball for Chavez insecurities and decided that no ambassador should be subjected to the torture of representing the US in today's Venezuela. By having Palmer talk too much, relations are not broken, information keeps flowing to the embassy since there is nothing that a good chargé d'affaires cannot manage. And in time of economic crisis you save the pay check of an ambassador that would be useless anyway as no high member of the Chavez administration would dare to talk to Palmer without the express order from Chavez himself. Thus the US is leaving to Chavez the option to receive an ambassador while taking the opportunity to tell the world how bad things are getting inside Venezuela and that they do not really care for an ambassador there. Twisted but more productive than what you may think because the humiliated party will not be Palmer who might be already be breathing easier while he is shelving his plans to pack his suitcases to Caracas. Chavez is the one that will be upset. And NO, this does not mean that the US is planning an invasion to Venezuela and wants to protect his ambassador: the embassy is there, a huge one at that with plenty of US personnel processing hundreds and hundreds of visa petitions a week. I should know as I had to renew my visa recently and spent a total of 4 hours until I finally got to the interview windows, after maybe 300 people went ahead of me. Funny how a country whose president is always blaming the US for the evils of the world is still having huge lines of people trying to get in... At any rate, too many interests still in Venezuela, too many US citizens still here to even consider a bombing raid somewhere and thus a putative need to withdraw the ambassador before he is taken as hostage or something. PS: sorry about the stupid pun of the title, I could not resist. When your neighbor's child is homely and stupid, and then waxes poetic about how beautiful and smart her child is, diplomacy requires us to support the fantasy and even lie in agreement, when necessary. However, when the child starts to torture cats and set fires, and the neighbor refuses to recognize the signs that there is a problem, then the time for diplomatic white lies has passed and the time for confronting the truth has arrived. This laughable defense minister ends the stupid speech with "Patria o muerte, venceremos" talking about Palmer's US comments? What a retarded CLOWN, is what most people with minimum education are thinking everywhere in the world. Obama and Uribe must have enjoyed a chuckle or 2 if they wasted 5 minutes time reading such stupid rant. What is the best thing for the U.S. to do? Absolutely nothing. El Presidente is imploding, and no comments from the U.S. are likely to hasten the process; they may well work to his advantage, because he needs to fight the "Great Satan" to enhance his domestic popularity. Actually i think that this type of comments speed up Chavez demise. After all Palmer did not say anything that was not already vox populi here, and he did not mention any plan as to what the US wanted to do, which is probaly what caused the Senate leak, if there was one, as many in the Senate would like to see a more proactive policy toward Chavez. You may well be correct and I hope you are. If so, the more "teasing" of that sort the better and I stand corrected. Likewise I have no idea about the backstage of this latest diplomatic pantomime, but the performances are certainly changing - at long last - to the credit of the United States and to the detriment of Chavez. A quite devastating touch, to have the would-be ambassador as black as the Ace of Spades! And Venezuela playing right along. I couldn't play the video (and wouldn't understand it if I could) but just have to note that rather obvious but telling spectacle of the defense minister in battle fatigues; something I'm sure residents don't even bat an eye over these days, but one of those little touches that enables one to immediately distinguish a democracy from its nemesis. Without wanting to sound racist, I gotta tell you I laughed out loud when I saw a picture of Mr. Palmer! I mean, the guy looks like he could come from St. Joseph of Little River (that's San Jose de Rio Chico for our Venezuelan friends). And his hair? That was funny to see too. But I really started laughing hard when I imagined him presenting his credentials to Chacumbele, I could even hear Chacumbele coming up with some racial remark like "Bienvenido, Chorro de Humo! (Column of smoke) or some such remark. Seriously though, I think Daniel you have an interesting point about the leak, that it's a way of not sending an ambassador without causing a major diplomatic incident. I myself think, however, that it may have leaked by a Chavez sympathizer. It would not be too much of a stretch to think that some Senator or other has staff that is at least sympathetic to the Chavez regime. What would they gain by doing so? Distract attention from other, local problems like the food scandal. Or perhaps they figured Mr. Palmer would actually prove to be the beginning of a new hardening of tactics and would prefer to see someone more malleable. Apparently, Patrick Duddy never met with any Venezuelan officials. Thus, Daniel's point that there is no point to having an ambassador in Venezuela is valid. The ambassador in 2008 was expelled to show solidarity with supposed US intervention in Bolivia, so Hugito will have to come up with some other response next time. Robert's speculating that some Democratic Party personage sympathetic to Thugo may have leaked this information is something well worth considering. As is Daniel's take. 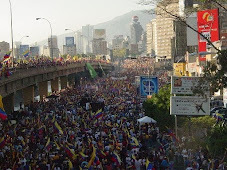 "In Venezuela, with Chavez, is really an incredible revolution - a democratic revolution. To begin to put in place things that are going to have an impact on the people of Venezuela. "The property owners and the folks who then controlled the media in Venezuela rebelled - worked, frankly, with folks here in the U.S. government - worked to oust him. But he came back with another revolution, and then Chavez began to take very seriously the media in his country. "And we've had complaints about this ever since." Lloyd said this before he took office. I'm pretty sure the leak theory isn't valid, as I believe that ambassadorial testimony from their nomination hearings are in the public record, as a matter of course. I was able to find, for example, the testimony of Duddy before he was approved: http://frwebgate.access.gpo.gov/cgi-bin/getdoc.cgi?dbname=110_senate_hearings&docid=f:48267.pdf . (Note that Brownfield was there at the same time, pending his approval to go to Colombia - there are some funny exchanges over his time in Venezuela. See the bottom of p. 424 and top of 425 for one example.) I only skimmed it, but I think you can find some things in there that are no, or not much, more incendiary than anything Palmer said. I doubt that anyone at State predicted that Chavez would react this way (though they might have considered the possibility). Howver, it's clear from the support Palmer got in the press briefing "He has conveyed his answers to the Senate as part of his nominating process. They convey our best judgment on issues between the United States and Venezuela" from http://www.state.gov/r/pa/prs/dpb/2010/08/145750.htm suggests that any new Ambassador would say the same stuff. It's their job to quote the "party line," rather than freelance, as you know, even in the U.S. And as we saw with Duddy, they're willing to not have an Ambassador rather than back down on what they're saying. But while I question a couple of your suppositions, I'm quite in agreement with your conclusions. It's typical Chavez - symbolism without a substantive difference. My first reaction on seeing Palmer's hair was a little like robert's - I thought he could have just walked off the set of Disney's "Song of the South." and AIO's response, I guess my theory loses validity. Looks like State is pretty set on who they want to send down here. So your theory, Daniel, looks better. Palmer will be confirmed, Chavez won't back down and grant Palmer placet, and the US will not have an ambassador in Venezuela for a while.